Discussion in 'Colored Gemstones' started by Bella_mezzo, Nov 28, 2018. I bought this stone a few years ago and thought I knew how I wanted to set it, but life and budget realities got in the way...when i came back to this project this year (As my 40th birthday present from my DH I realized I wanted a more vintage setting. I just got the finished photo from Ivy & Rose and can not wait for it to arrive!!!!!!!! ratatat, Sirenagirl, lovedogs and 31 others like this. I love it! That’s a gorgeous spinel and the setting is absolutely perfect for it. I love all the little details. Can’t wait to see a hand pic. rockysalamander and Bella_mezzo like this. Oooh I love it!! I can’t wait to see your hand shots! Lovely stone and ring, thanks for sharing! Wish I could take such nice pictures. So gorgeous! My fave type color of spinel too! Ivy and Rose did abeautiful job on the setting. Can't wait to see your photos! Beautiful! Everything about it is lovely. Happy birthday! That is a beautiful, beautiful ring! Happy Birthday! Gorgeous! I love the vintage look and the spinel is beautiful. Happy birthday!!! What an amazing ring! Will look forward to seeing more photos when you receive your lovely. holy WOW!!! I have 4 gems cut by Peter and love his style! This spinel is stunning! That setting is perfect! I love how the prongs follow the long facet lines. Cannot wait to see hand shots! Happy 40th!!!! Many more pictures, hand shots, sun, shade, tree, etc! Happy 40th bday too!! Bella_mezzo and Hivona like this. Oh wow this is gorgeous @Bella_mezzo! Totally a ring I would love to own. Can't wait to see it on your hand, please please come back with pics! And it's great to hear from you, I've always enjoyed your posts! That is really a perfect ring! The setting suits the stone well, and I think it has a vintage vibe. It reminds me on Tiffany rings! Stunning. Substantial yet elegant. LOVE. Wow I love the stone and the setting!!! Your stone looks GREAT in that setting. Happy Birthday!! Please come back and post more photos once you get the ring. Very pretty! I can't wait to see more shots. 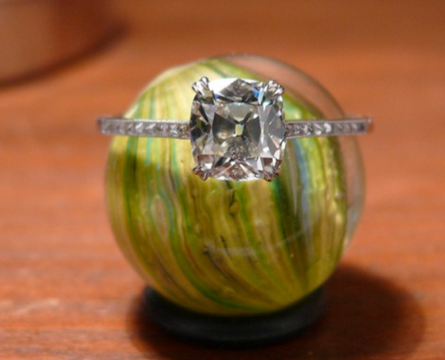 I love it when the color and cut of the stone are completely complimented by the setting - and this is such a case. It takes a ring and makes it an heirloom masterpiece. Love it! How did I miss this? Absolutely spectacular @Bella_mezzo, and it's so nice to 'see' you again! I hope you and your beautiful family are well and aren't too crazy busy! Enjoy your new ring, it is sooooo gorgeous. Oh, wow! Such a lovely stone and setting combo!